quarters ended March 31, 2017 and 2016, respectively. by 3.2% as compared to the first quarter of 2016.
purchased on behalf of two of its joint ventures. fully diluted common share of $1.26. Paid a quarterly dividend of $0.95 per share of common stock. quarterly dividend from $0.95 to $1.00 per common share. operating costs increased 32.4%, resulting in an NOI increase of 28.0%. 2016, and expenses incurred with the Company’s change of name. impact included all major markets in Florida; Atlanta, GA; and St.
temporarily over-built point in the cycle. During the quarter, the Company acquired one property in Chicago, IL. $10.1 million upon issuance of a certificate of occupancy. is committed to contribute a total of $11.8 million. hand, and $201 million available on its line of credit. $80.62 through its Dividend Reinvestment Plan. Company now expects a significantly greater use of leasing incentives. developed a significant queue of prospects. expected yields in excess of 8% at stabilization. of credit which carries an interest rate of LIBOR plus 1.10%. $0.01 to $0.03 per share due to the aforementioned acquisitions. 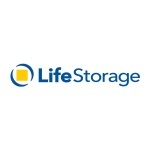 accessing the investor relations tab at lifestorage.com/. in 29 states. For more information, visit http://invest.lifestorage.com/. * See exhibit A for supplemental quarterly same store data. with GAAP, as presented in our consolidated financial statements. stores managed by the Company. expense, investor relations and miscellaneous other expenses.